After ten years of membership, I doubt I need a guide, but hey, it's the thought that counts, is it not? So it's April First, and while I would not exactly consider this a prank, I was certainly surprised to visit the website and see the little guy floating about in my window, making occasional statements and bounces. It does make a variety of statements though, such as "Don't you wish you could adopt me? ", and "Didn't I Used to Come in More Colors?" which are probably made in reference to the the Adopt-a-Chocobo program we used to have. I never really did take advantage of that, since I never had a website. Is this how it used to work? Anyway, I wish I could stick around and see more of what Boco says, but my personal computer broke down, and this is a borrowed computer which I should be returning right now. It is by mere chance that I got the opportunity to see it at all. By the way, the little bugger wants a Final Fantasy XIII forum. I wonder if this is a hint at something? Your timing has been bad for a while! Here's where we first deployed Boco Buddy. You're right, his art did come from the same chibi chocobo art that was once used for Adopt a Chocobo, though that was a simpler time and the chocobos we used for that didn't actually... do anything. They just sat there. I created all of the animations and audio for him specific for this use, and his quips are a joint effort between me and Neal. Also, I'm pretty sure he distracted from this year's April Fool prank, which has me a little sad. To be fair, this year's was incredibly subtle so if nobody noticed it it will just come back next year in a more obnoxious way because, well, spite. I had to laugh when Boco Buddy said "My cousin is metal". I realize it was probably a reference to Word's paperclip, but I immediately thought of Lid's robotic chocobo from FF Brave Exvius. Now I'm wondering what was the other joke that I missed. I didn't spend too much time exploring the site though; since it was also Easter I was rather busy with family obligations. It is actually a two-way reference. 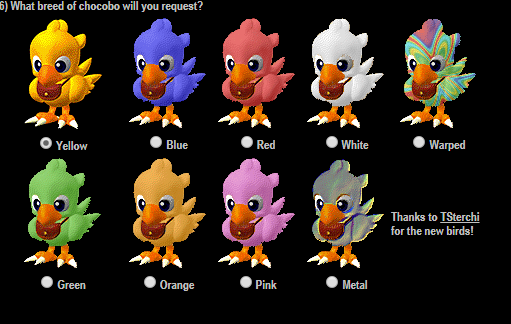 You're correct about the reference to Clippy, but the other one is back to our old Adopt a Chocobo "feature" that Tonepoet mentioned, in which one of the options was a "metallic"-looking chocobo. What about a man adopted by chocobos? Who wants to read everything in the library with me? Boy that light's been on a while.